From wildlife to insects to fungi, there are many organisms that pose potential threats to the health of an aspen tree. Aphids are small insects that feed by sucking plant sap from leaves and excrete a sweet, sticky substance called honeydew. The damage is mostly unsightly but, in the long-term, may kill the branches they feed on. Aphids occur on almost all types of trees and shrubs. They usually do not damage plants and are controlled by natural enemies such as lady beetles. Problems most commonly occur where aphids produce leaf curls, such as on ash, plum, honeysuckle and snowball viburnum. Check for natural enemies before treating with insecticides. Systemic insecticides are particularly effective when aphids have curled the leaves. Contact insecticides and soaps are useful when aphids are exposed on leaves. Ink spots are a result of the fungus Ciborinia and are commonly found in dense aspen stands. This disease causes leaf discoloration and early leaf drop, which may reduce tree growth. Five fungi cause most foliage diseases on aspen, cottonwoods and other poplar species. Foliage diseases develop readily in wet, cool weather. Foliage diseases decrease a tree’s aesthetic value and can cause premature defoliation. Severe outbreaks can affect the general health of the tree. To reduce future disease problems, rake up and dispose of leaves and prune out branches with cankers. Timely fungicide application can prevent severe outbreaks. The Marssonina fungus causes this most common disease on aspen foliage. Although there is leaf discoloration, this condition usually is not damaging. Heavy infestations cause early leaf drop. Severe outbreaks can affect the general health of the tree. To reduce future disease problems, rake up and dispose of leaves and prune out branches with cankers. Adult leaf miners cut tiny slits on aspen leaves and lay their eggs inside. The larvae live inside the leaf and feed by “mining” chlorophyll from plant cells; this is not harmful to the tree’s health. Leafminers develop and live within leaves, where they feed on the soft interior tissues. Broadly categorized by the shape of “mines” produced by their feeding, leafminers include many different insects. Leafminers rarely are abundant enough to injure the plants they infest. The more common leafminers in Colorado are spinach leafminer, cottonwood blackmine blotch leafminer, lilac leafminer, birch leafminer and ponderosa pine needle miner. Sawflies are closely related to wasps. The larvae are plant feeders and look like hairless caterpillars. Sawflies often feed in groups and can quickly defoliate portions of their host plant. Elk browse on the shoots and stems of aspen trees, creating wounds and allowing the introduction of diseases. This defoliating caterpillar feeds on the leaves of aspen, causing aesthetic damage. Consecutive years of defoliation, however, may kill the tree. Several species of caterpillars construct a silken shelter or tent. In spring, tent caterpillars are common. After midsummer, the most common tent-making caterpillar is the fall webworm. These insects attract attention due to the conspicuous tents. However, they rarely cause any significant injury. Greatest injury occurs from early season defoliation, particularly on stressed plants. Many biological controls naturally regulate populations of these insects. Scale, a common and destructive pest, overwinter on trees and harm them by sucking sap. Branch and tree death are possible with long-running infestation. Oystershell scale is a common insect pest of many woody plants in Colorado. Oystershell scales feed on the plant by sucking plant sap. Heavy infestations can kill branches and even cause the decline and death of the tree. In most areas of Colorado, there is only one generation per year. Oystershell scales overwinter in the egg stage. The eggs hatch in the spring and the newly emerged insects quickly attach themselves to the plant. Oystershell scale can be controlled in the winter by using a dormant oil. This slowly developing canker is caused by the fungus Ceratocystis fimbriata and is easily recognized. The canker rarely kills the tree due to its slow development. slowly developing canker is caused by the fungus Ceratocystis fimbriata and is easily recognized. The canker rarely kills the tree due to its slow development. This curious spider-shaped track is made by the larvae of a fly and is not harmful to the health of the tree. This wood-boring beetle lays eggs on the bark of the aspen. The larvae then tunnel, weakening the wood. Entry and exit holes of the beetle invite fungi, which can result in limb breakage. 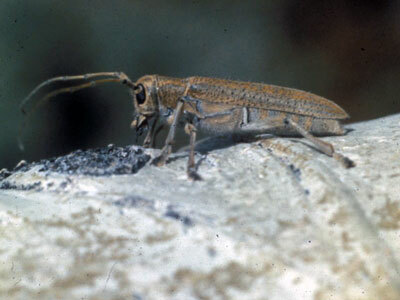 Shade tree borers are insects that develop underneath the bark of trees and shrubs. Certain beetles and moths are the most common borers. Most shade tree borers can successfully attack only trees that are injured or stressed. Shade tree borer development takes from one to three years to complete. Adult stages of these insects occur outside the tree. Control of shade tree borers includes maintaining growth and vigor of the tree or shrub. Insecticides can best control shade tree borers if they are applied when adult insects are laying eggs on tree trunks.